I need help! Well, in a million more ways than one, but that's another story for another day. My new project is pretty simple: paint. A couple of the rooms in our house (namely: the kitchen and dining room) need to be freshened up with a little paint. See?! Not too big of a project... and since the bathroom renovation is at the point where we need some professional plumbing work and about twelve plus hours of man power, it is on the back burner. Don't worry, it will get some attention this weekend. Back to the paint. Some time ago, I ran across this picture (and I can't, for the life of me, remember the source?!). Amazing, isn't it? 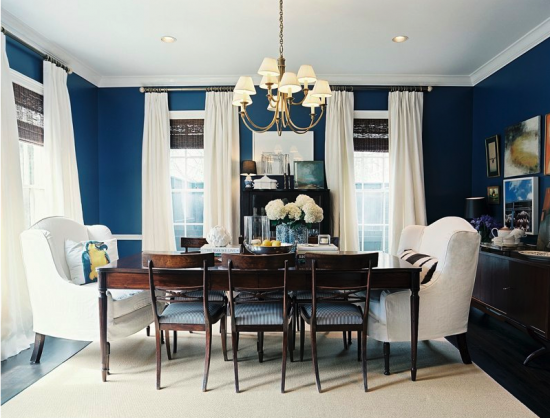 Up until, oh, about 8:30 last night, I was hands-down, 100%, most certainly planning to paint our dining room this fabulous navy color. I thought it would work perfectly with the neutral rooms that are adjacent to the dining room. Our neutral living room plus a bit of yellow (which, of course, would go fabulously with navy). And our adjacent kitchen is soon-to-be all white. Think something like this. So what is the painting hold up? Well, I started picturing the navy dining room with furniture in it. Our previous house did not have a formal dining room and so we currently do not have any dining room furniture (only a breakfast table). David and I have a pretty good idea what kind of furniture we want for the dining room, though. And it goes a little something like this. 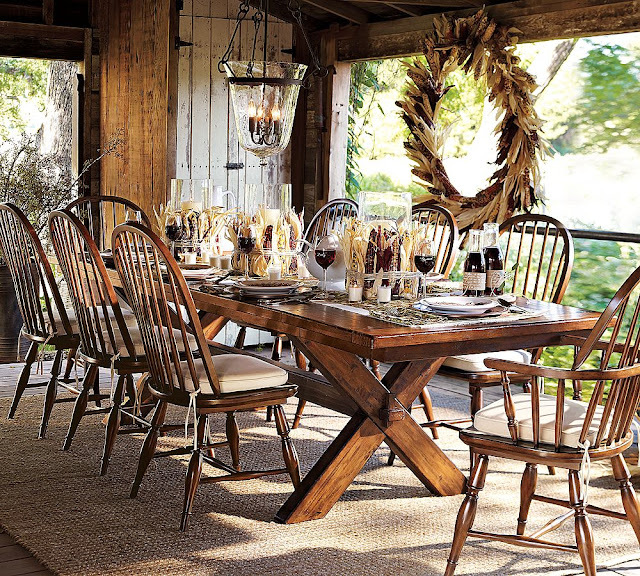 ﻿﻿Yes, the outside of a barn is our dream dining room. So pretty, isn't it? But not too formal. Nothing about our home is too formal, so that certainly suits our fancy. BUT, when you look at all of the pretty furniture in my navy-dining-room-inspiration picture, you see furniture that is delicate. Light. Fancy. Formal. Certainly not farmhouse style. With that said, I am now worried that the type of furniture we want in the dining room will be too bold and heavy for the navy walls. Especially in such a small little room as our (empty!) dining room. Just for an idea, here is our dining room with the previous owner's furniture in it (don't worry, the chandelier is going to go- it's already on Craigslist!). So, I'm in a conundrum. I think I have to drop my beautiful navy. I just don't think it will fit in. But I have absolutely no clue what color to replace it with. And it will have to be a fabulous paint color in order to repair my sans-navy broken heart! What do you think? I seriously need some help! Go with the navy? Is the navy too much? Do you have any suggestions for any other fun colors? I really would love to know what all of you think. And please email me pictures if you've got any inspiration photos! I personally love Navy. I actually collect cobalt and white dishes, so it just goes with my style. I think you can combine the two looks you love in you bring in light accessories.. White window treatments and a white rug, just like in the inspiration photo. Really, although the furniture is smaller in your inspiration photo, it is still really dark, with exception of the two end chairs. You could always go with the farmhouse style table and side chairs, with lighter, slipped chairs on the end. I still think you can make it work. Are you planning to paint only above the dado rail in navy and below in white? I think it could work really well if you chose the navy carefully. Or you could go for navy accents (napkins etc). Why don't you paint a wall and see? That's the gorgous thing about paint. You can just paint over. I definitely think the navy will work. 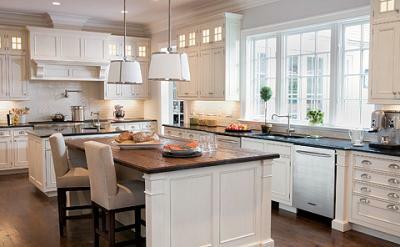 If you choose a deep enough color the dark/farmhouse wood look would really mesh well. To Lauren's point, its all about the accessories to maket he room how you want it - the curtains, chair covers, things on wall, china. My other thought was a deep red but that would NOT look good withe the peach color in the other room. I would say stick with your gut and just adjust your accessories to get the look you want! Is there anyway you can compromise on the farm table & chair finish? You can paint mismatched chairs you find (that look like those chairs in the outdoor barn picture) white & keep the original grain of the heavy recycled barnyard door table. It will create the aesthetic of the original navy blue dining room, but have a funky barn twist instead of a formal twist. I think you could find some great chairs at Goodwill, etc & paint them all a great picket fence white w/ some light & unique cushions to bring the navy into the scheme. oh i think the blue would be stunning on the walls with the white lowers. i do think that you may want to slipcover your chairs with some white linen just so the room is not so dark, and add dramatic white curtains like in the inspiration pic. I would certainly do either white linen covered chairs or white painted covered chairs (or both!) to throw off a heavy wood table. Do it!!! I think the navy would go great in your house! Love the impact of the deep color!! Our powder room is Navy and I LOVE it! I can look up the color if you're interested! We also have been on a dining room table search -- we're hoping to find a modernized farm table with an expansion leaf. The plan is to use our dining room for both casual and formal dining, then convert our breakfast nook into a keeping room (for early morning coffee and evening cocktails). Let me know if you find any other nice farm tables! I'm hoping to score a nice, rich mahogany table to bring a casual elegance to our dining room. Let the search continue!! Thanks for the confidence, ladies! NAVY IT IS! :) Hopefully we can pin down a shade this weekend.... You guys rock! I'm a little late to the topic but thought I would chime in. I love the farmhouse table (hope to have one in my house someday!) and while I love navy, it seems a bit sophisticated, if you know what I mean. I think a warm grey-brown like Martha Stewart Soapstone Grey would really work with the rustic table and it would go with the colours in the adjacent room. Good luck - picking paint can be so difficult! Well, I'm late to the party but wanted to say, I love navy! I could see it with the rustic table in a Ralph Lauren kind of way. And have even been dreaming about using it in my house some day. I'm in a borrowed house right now so we can't paint. Can't wait to see how yours turns out! Also, I love your blog layout. I'm headed over to Penny Lane to see what she can do for mine. The navy is gorgeous! I love it with all the white furniture and accents. I meant to add...there are pics of our old kitchen on my blog.